Mobilefun.co.uk have very kindly sent over a Veho Pebble Smartstick Portable Charger. This is a pocket sized charger with a full size USB plug on top and a bunch of interchangeable connectors for most of your mobile needs. The technical specifications see a 2200mAh capacity at 3.7V, DC-IN: 5V/500mA, DC-OUT: 5V/500mA. As mentioned already this is a very small portable battery measuring at 22mm width and 86mm length. Weight is only 70g. 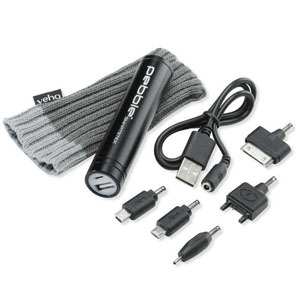 The package contains charging adapters for iPhone (30-pin), Micro USB, Mini USB, Sony Ericsson and Nokia.